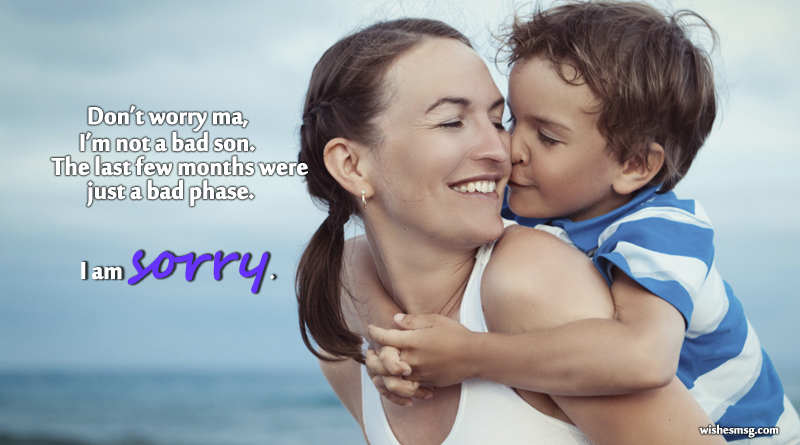 Sorry Messages and Quotes For Mother : Making mistakes is a common nature of all human beings. Sometime we have hurt our mom in rough mood and does something wrong that we shouldn’t have to do. 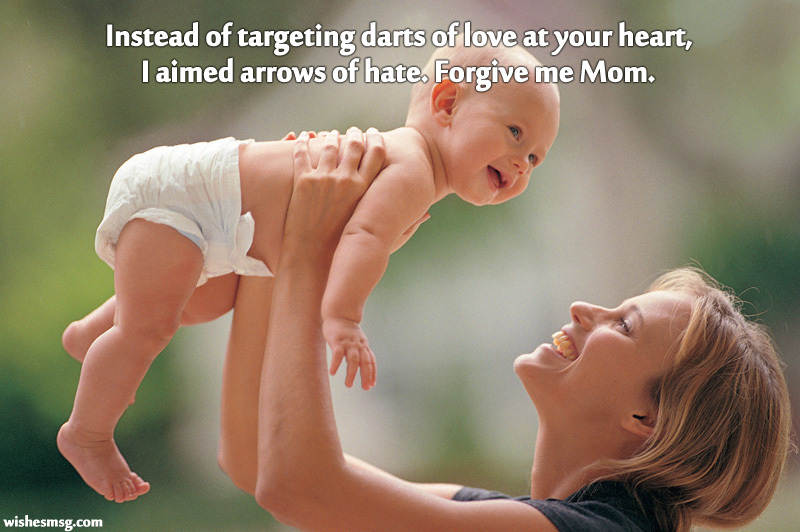 Thanks to God there is repentance and forgiveness and it is sure that our mom loves and care us unconditionally. If you have wronged with your dear mother then don’t be late to apologize and show your mom how bad you feel for your wrong doing. Here’s the best I am sorry messages for mother for this situation when you just can’t find the right words to make your apology. Read on to find the perfect words of apology to show your mom how much you value her and you are really on shame for being rude to her. Share the best one via social media or send a heartfelt handwritten sorry note with a gift. From the day I was born to this present day, I have not been the son that you deserved. But I promise that tomorrow will be the magical day when your son will be reborn to become the child you truly deserve. I am sorry mom. You filled my soul with love and care, but I left your heart glum and bare. You filled my life with all things nice, but I filled yours with worries and cries. Sorry mom. Don’t worry ma, I’m not a bad son. The last few months were just a bad phase. I am sorry. I wasn’t myself yesterday, but I want you to be your forgiving self and pardon me. Sorry mother. By hurting you, I was scathing myself. By being angry at you, I was disparaging myself. By criticizing you, I was relegating myself. Sorry mother. Mom, I know it seems that I hate you. I know it seems that I want to do everything you tell me not to. But deep down inside, I know that you mean the best for me and my heart knows that no matter how much we fight, I will love you forever. I’m sorry. You have always accepted me for what I am, whether good or bad. Now I will start accepting myself for what you want to me to be. Sorry for everything mom. I never meant to insult you but my worlds let me down. I never meant to be rude but my actions let me down. I’m sorry mom, I promise to keep my words and actions in check next time around. Instead of giving you the asset of a great life as a parent, I gave you liability by being a stubborn daughter. Sorry mom. You are the most beautiful mother in the world, but I am like an ugly scar on your face. Sorry. I am the superlative of horrible but you are the superlative of nice. Let’s strike a balance. Sorry mother. I came to you only when I was blue. But you always stood by my side, proving that your love for me is unconditional and true. Sorry for being selfish. The cycle of the perfect apology starts with a Mistake followed by Regret, followed by a Sorry, followed by Forgiveness. I did the first three, please complete the last. I am sorry mom. I will make you heave a sigh relief, by showing you that your daughter has turned a new leaf. Sorry mom. Instead of making your life a bed of roses, I made it a blanket of thorns with my painful words. Sorry mom. Throughout my teenage years I have called you many names including Annoying and Irritating. But now I realized that it was me who was being all that and a lot more. I am sorry mom. Sorry for causing all this trouble, sorry for reducing your life to rubble. Forgive me mom. Don’t lose your faith in me, ma. I will pull myself out of the mess I’ve caused and I will rise above. Nothing can stop me as long as I’ve got your blessings. I’m sorry. I regret my mistakes but I will never let them cause regret in your heart. I am sorry mommy. Don’t worry mom, everything will be alright. I know I have made a few mistakes but I promise to fix them and become a better person. After all, I have grown up in the arms of a mother who has given me nothing but the best values of life. I am sorry. You came to heal me with a balm, but I retaliated and lost my calm. I apologize, mom. The best mom of the world did not get the best son of the world, but she deserves the best apology of the world. I am so sorry. I was born to spray a dash of vibrant colors in the canvas of your life, but I washed out everything with the dull tones of sepia. Sorry mom. 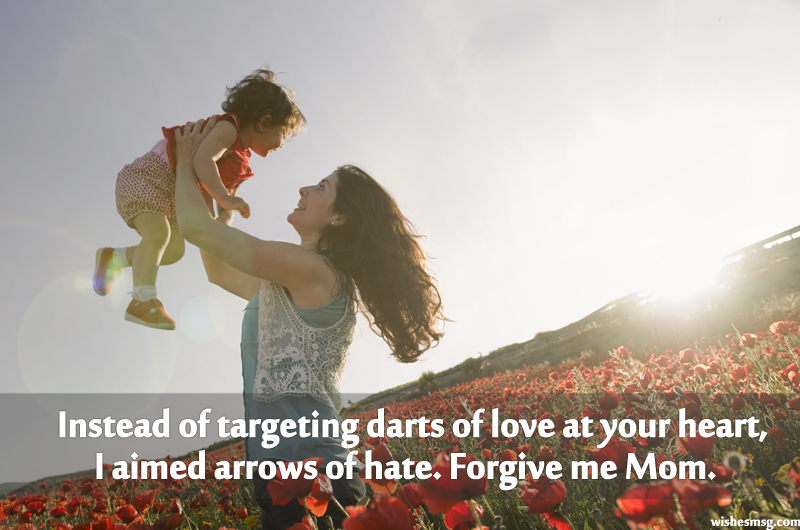 Instead of targeting darts of love at your heart, I aimed arrows of hate. Forgive me mom. I am not sorry for not being perfect, but I am sorry for always being incorrect. Forgive me mother. I hate myself for being rude to a woman who never hated me despite the fact that I hated her. Mom, I love you and I’m sorry. I meant to give you happy memories, but I gave you dreadful nightmares. I aimed to give you sweet moments, but I gave you frightening thoughts. I wished to make your life heaven, but I made it hell. Sorry mom. I can’t believe I made the same woman unhappy who gave up all the happiness in her life just so that I could be happy. Sorry, ma. I want to be grounded, scolded and punished so that I can turn a new leaf and be complimented, applauded and loved by my favorite person in the whole world, my mother. I am sorry mom. I apologize to the person who taught me how to apologize and I seek forgiveness from the person who taught me how to forgive. Sorry mom. Dear mom, sorry for thinking that I was always right. Sorry for not considering your insight. Sorry for always using my might. Sorry for making you love me in spite. Dear mom, it has taken me a long time to realize what you mean to me, but it won’t take me long to say that I am sorry. I will be your strength, not your weakness. I will be the reason for smiles, not fights that are endless. I will be a beacon, not a cause for stress. Sorry mom. Mum, you are awesome. Mommy, thanks for being there for me. Mother, like you there is no other. I am sorry. I never knew how much I hurt you all these years until I became a mother myself. Mom, I know this is late but I mean it from the bottom of my heart – I am sorry for being such a brat throughout my teenage. I want to make up for all the lost years by making sure that I give you more reasons to smile than the way I made you frown earlier. Dear, we hope that our compiled “sorry messages and quotes for mother” will help you to ask for her forgiveness. 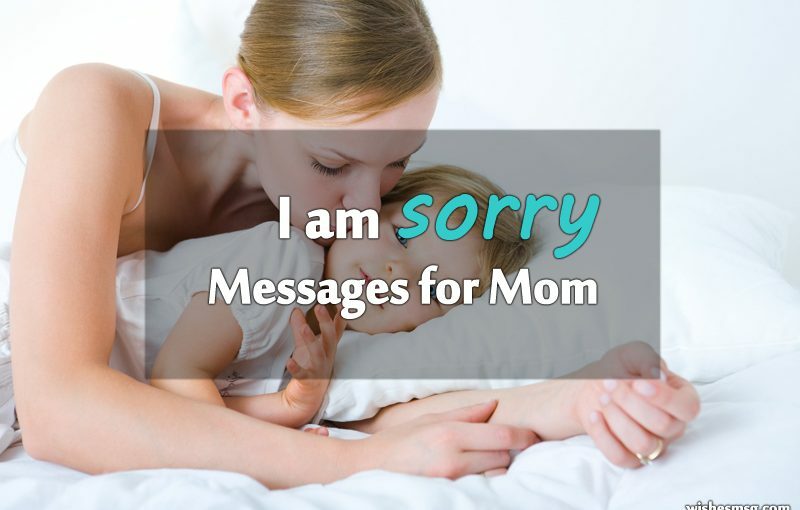 You may share or send these apology messages to mom via Facebook, Whatsapp or Twitter.